07.12.18 10:27;Account;Receive;Received Payment 4.2 USD from account U15359067 to account U1294000. Batch: 238825993. Memo: API Payment. Withdraw to allhyips from DERGlobal Limited. 08.12.18 09:23;Account;Receive;Received Payment 4.2 USD from account U15359067 to account U1294000. Batch: 238917637. Memo: API Payment. Withdraw to allhyips from DERGlobal Limited. 09.12.18 09:38;Account;Receive;Received Payment 1.00 USD from account U15359067 to account U1294000. Batch: 239008993. Memo: API Payment. Withdraw to allhyips from DERGlobal Limited. 09.12.18 09:32;Account;Receive;Received Payment 4.2 USD from account U15359067 to account U1294000. Batch: 239008195. Memo: API Payment. Withdraw to allhyips from DERGlobal Limited. 10.12.18 23:01;Account;Receive;Received Payment 5.2 USD from account U15359067 to account U1294000. Batch: 239181984. Memo: API Payment. Withdraw to allhyips from DERGlobal Limited. 10.12.18 08:45;Account;Receive;Received Payment 4.2 USD from account U15359067 to account U1294000. Batch: 239098089. Memo: API Payment. Withdraw to allhyips from DERGlobal Limited. 12.12.18 23:37;Account;Receive;Received Payment 4.2 USD from account U15359067 to account U1294000. Batch: 239401970. Memo: API Payment. Withdraw to allhyips from DERGlobal Limited. 12.12.18 07:07;Account;Receive;Received Payment 4.2 USD from account U15359067 to account U1294000. Batch: 239316192. Memo: API Payment. Withdraw to allhyips from DERGlobal Limited. 14.12.18 23:02;Account;Receive;Received Payment 4.2 USD from account U15359067 to account U1294000. Batch: 239591152. Memo: API Payment. Withdraw to allhyips from DERGlobal Limited. 14.12.18 22:54;Account;Receive;Received Payment 2.00 USD from account U15359067 to account U1294000. Batch: 239590561. Memo: API Payment. Withdraw to allhyips from DERGlobal Limited. 16.12.18 06:51;Account;Receive;Received Payment 4.2 USD from account U15359067 to account U1294000. Batch: 239694043. Memo: API Payment. Withdraw to allhyips from DERGlobal Limited. 15.12.18 21:38;Account;Receive;Received Payment 4.2 USD from account U15359067 to account U1294000. Batch: 239674260. Memo: API Payment. Withdraw to allhyips from DERGlobal Limited. 17.12.18 04:30;Account;Receive;Received Payment 4.2 USD from account U15359067 to account U1294000. Batch: 239771038. Memo: API Payment. Withdraw to allhyips from DERGlobal Limited. 18.12.18 04:38;Account;Receive;Received Payment 4.2 USD from account U15359067 to account U1294000. Batch: 239876050. Memo: API Payment. Withdraw to allhyips from DERGlobal Limited. 19.12.18 08:53;Account;Receive;Received Payment 4.2 USD from account U15359067 to account U1294000. Batch: 240002742. Memo: API Payment. Withdraw to allhyips from DERGlobal Limited. 19.12.18 08:27;Account;Receive;Received Payment 1.00 USD from account U15359067 to account U1294000. Batch: 240000388. Memo: API Payment. Withdraw to allhyips from DERGlobal Limited. 20.12.18 05:57;Account;Receive;Received Payment 4.2 USD from account U15359067 to account U1294000. Batch: 240088191. Memo: API Payment. Withdraw to allhyips from DERGlobal Limited. 21.12.18 21:53;Account;Receive;Received Payment 5.2 USD from account U15359067 to account U1294000. Batch: 240262738. Memo: API Payment. Withdraw to allhyips from DERGlobal Limited. 21.12.18 05:29;Account;Receive;Received Payment 4.2 USD from account U15359067 to account U1294000. Batch: 240184052. Memo: API Payment. Withdraw to allhyips from DERGlobal Limited. 23.12.18 20:39;Account;Receive;Received Payment 6.7 USD from account U15359067 to account U1294000. Batch: 240422854. Memo: API Payment. Withdraw to allhyips from DERGlobal Limited. 22.12.18 18:28;Account;Receive;Received Payment 2.5 USD from account U15359067 to account U1294000. Batch: 240338762. Memo: API Payment. Withdraw to allhyips from DERGlobal Limited. 24.12.18 15:45;Account;Receive;Received Payment 4.2 USD from account U15359067 to account U1294000. Batch: 240486523. Memo: API Payment. Withdraw to allhyips from DERGlobal Limited. 27.12.18 03:30;Account;Receive;Received Payment 4.7 USD from account U15359067 to account U1294000. Batch: 240690783. Memo: API Payment. Withdraw to allhyips from DERGlobal Limited. 25.12.18 21:54;Account;Receive;Received Payment 5.2 USD from account U15359067 to account U1294000. Batch: 240593045. Memo: API Payment. Withdraw to allhyips from DERGlobal Limited. 25.12.18 21:03;Account;Receive;Received Payment 4.2 USD from account U15359067 to account U1294000. Batch: 240590120. Memo: API Payment. Withdraw to allhyips from DERGlobal Limited. 27.12.18 21:59;Account;Receive;Received Payment 4.2 USD from account U15359067 to account U1294000. Batch: 240768604. Memo: API Payment. Withdraw to allhyips from DERGlobal Limited. 29.12.18 13:59;Account;Receive;Received Payment 4.2 USD from account U15359067 to account U1294000. Batch: 240892221. Memo: API Payment. Withdraw to allhyips from DERGlobal Limited. 30.12.18 07:56;Account;Receive;Received Payment 4.2 USD from account U15359067 to account U1294000. Batch: 240939247. Memo: API Payment. Withdraw to allhyips from DERGlobal Limited. 31.12.18 12:11;Account;Receive;Received Payment 4.2 USD from account U15359067 to account U1294000. Batch: 241022616. Memo: API Payment. Withdraw to allhyips from DERGlobal Limited. 01.01.19 13:33;Account;Receive;Received Payment 4.2 USD from account U15359067 to account U1294000. Batch: 241415558. Memo: API Payment. Withdraw to allhyips from DERGlobal Limited. 03.01.19 15:30;Account;Receive;Received Payment 4.4 USD from account U15359067 to account U1294000. Batch: 241604427. Memo: API Payment. Withdraw to allhyips from DERGlobal Limited. 02.01.19 13:20;Account;Receive;Received Payment 4.4 USD from account U15359067 to account U1294000. Batch: 241501150. Memo: API Payment. 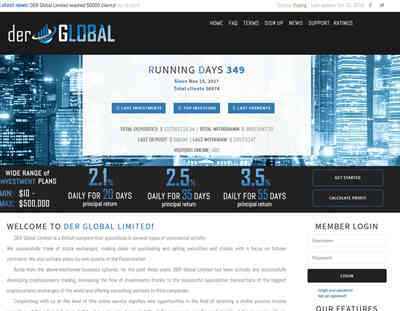 Withdraw to allhyips from DERGlobal Limited.